An investigative process of the object & people’s relation to space . How to design a framework which serves as a ground for invitation and play in relation to how we move in the architecture. Space Alteration is the result of a collaborative effort between Felix Andersson and Christian Isberg. Space Alteration is the design of a framework; the framework is constantly changing in relation to the construction of the physic space. How do we navigate thru architecture ? How does objects, people and space relate to each other? 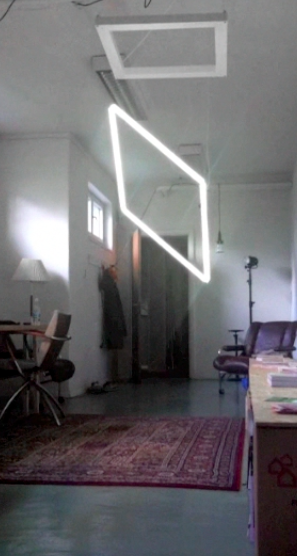 We created a framework which scans the dimensions of the room , the framework then ‘talks’ to engines which positions fluorescent lighting tubes, which in turn, visualize objects and people’s position . Relationship between objects/people and the room is shown in the design of abstract shapes that constantly shifts. The framework is designed so that the rules and restrictions are strict enough but enough open for a invitation to explore how the abstract forms created relate to the framework and the room. 1. The lamps take a basic position in the shape of a square. 3. The rangefinder starts to look for changes in the room. 4. Are there changes, the exact position of the change is sent to 6 motors, which positions 4 fluorescent tubes, this enables a variety creation of a variety of forms. 5. When the change is complete, the sensor begins search for new changes in relation to the past.